During our Redeeming Life: LIVE last night, a participant asked me what I would do if I were the pastor of Sutherlands Springs in Texas. A man walked into First Baptist Church of Sutherland Springs and killed 26 people and injured 20 others. It was a tough question. All I could think about was my friend, Pastor Mike Clements. 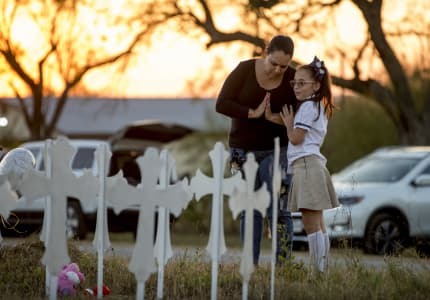 He's the pastor of First Baptist Church in Floresville, just 15 minutes from Sutherlands Springs. He lost 14 friends. The two churches work together each year. I had been praying for my friend since Sunday. Mike and I were in the same DMin cohort at Gateway Seminary, and we defended our projects on the same morning. We had dinner together, coffee the next morning, and lunch after we defended. Mike's heart is for Jesus, and it's inspiring. The love of Jesus flows out of him so much so that he can't help but tell others about Jesus, all the time. Any place, any time, any person. At lunch, I asked him, "So, Dr. Mike, what's next for you now that you've finished the DMin?" In his big Texas drawl and soft style he said, "Well Dr. Bryan (we both chuckled), I plan to give my entire life over to sharing the gospel of Jesus Christ to any and everybody who will listen. It's important that people know Jesus. In fact, it's the most important." Three weeks later, a man walks into a church and does the unthinkable. Mike Clements, approached by the media and filled with the Holy Spirit, boldly points people to the hope and love of Jesus, the light of the world, even in the darkest times. If we had the modern day 'Book of Acts' for work and God and his Church today, I believe Mike's name would be found in it. Church, are you speaking light into the darkness around you? Are you preaching the gospel into your soul daily? If not, why not? Are you talking about the gospel and preaching it among the faith-family? It's one of the reasons God gathers his people into a local church. And when people come to you in the darkness, are you pointing them to the light of Jesus Christ? Redeeming Life, I'm calling on you to pray for First Baptist Church in Sutherlands Springs and First Baptist Church in Floresville. Pray for the pastor of both these churches. Pray for the families and the communities and these little churches. And pray for Pastor Mike. Finally, let's take a lesson from Mike's example. Let's give our lives over to something so much more eternal and more significant than the silly things we usually give our lives too. Let's boldly share Jesus everywhere we go. Any place, any time, any person. Watch how Mike points people to Jesus on national news, and hear the story from someone much closer to the situation than you or me. If you have a Facebook account, you can watch Mike tell Shepherd Smith about Jesus and then call the nation to both turn to Jesus and pray.